Rangers midfielder Lewis Macleod is on the verge of joining English Championship side Brentford, BBC Scotland understands. The 20-year-old is expected to travel south for a medical within the next 24 hours. A transfer fee of around £1m has already been agreed. Midfielder Macleod has been one of Rangers' brightest lights this season, netting eight goals in all competitions for the Ibrox side. He scored the only goals as Rangers secured 1-0 wins over Premiership sides Inverness Caledonian Thistle and St Johnstone in the League Cup. Macleod received his first call up to the Scotland squad for the Euro 2016 qualifier against Republic of Ireland and the friendly against England in November. 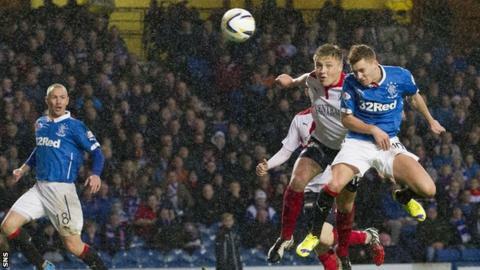 He was also named the Scottish Professional Football League's young player of the month for November. Having broken into the Rangers first team in the 2012-13 season, Macleod made 26 appearances that term and then 21 appearances in 2013-14, netting five goals. If the deal goes through with Brentford, he will be joining a side currently sixth in the English second tier. The Bees are managed by Mark Warburton, with former Rangers defender David Weir his assistant.